Estes Park Wool Market 2008-shopping for yarn! Throughout the day Pam and I returned to the vendors’ building several times at the Estes Park Wool Market. It was a paradise of beautiful fibers and yarns which all began as bags of hair from animals! Thinsulate insulated Kup Kollar on a hot take-out cup to hold in the heat longer and protect your hands. 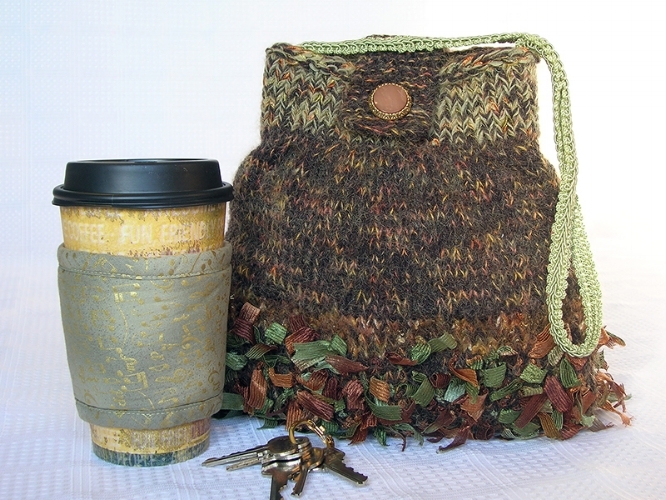 And when those hair fibers are spun into yarn, you can knit a stylish purse! I knitted this one with 5 different yarns. Of course, it had to have a color coordinated Kup Kollar (cup wrap) for hot and cold drinks!